If I have to choose only one, I would call ApricotAbra - dark chocolate, vanilla & apricot is *lurvely*. What do y'all think? Food P*RN for the masses! At last - you can have your very own El Bulli experience! As all good little foodies know, El Bulli is the razor-edge trendy Barcelona restaurant where food is raised to its ultimate level of high sophistication, and at the same time distilled down to its very subatomic essence! Of course, no one can actually afford to eat there, and if you could, good luck scoring a reservation. Hah! I heard that just last week they turned away Jude & Sienna, Vladimir Putin and the Pope! And that was on a slow night! Well, thanks to the miracle of modern technology and the sadistic pleasures others take at flaunting their good fortune the expense of the have-nots, this site has a Slide show of El Bulli's food! They have these 30-course meals that take about four hours to eat (excuse me, to experience), and by the time it's over, I would think diners must have quite a nosh on, and would need to go get some real food, judging by how ephemeral this looks - even after eating all of them I would still need some serious sustenance. However, this a nice voyeuristic alternative to actually paying a month's rent just to be hungry again after four hours of eating. Bon appetit! 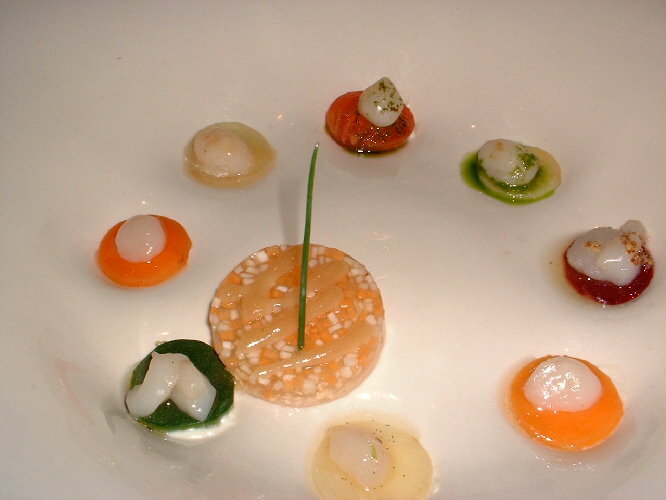 Here is a typical presentation - anybody have the faintest idea what this, is or how to consume it? Me neither. But I would just love to try!